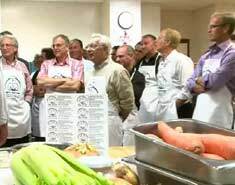 Our volunteer Chefs know that the best cooks are people that give. "You can taste it in the food," says Chef Michael Allemier. 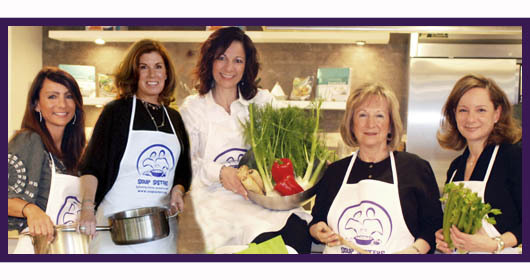 If you are looking for a great soup recipe you will find it from of our guest Chef facilitators featured in the Soup Sisters Cookbook. Julie Van Rosendaal, One Smart Cookie Inc.
Nicole Gomes, Nicole Gourmet Ltd.
Soup Sisters and Broth Brothers charge a $65 participation fee per person to cover the expenses of ingredients for the soups, the venue, equipment, supervision, and a Chef or professional facilitator. This ensures that the finest ingredients possible are used every time for the soups we provide to women, children and youth. Events are social evenings with lively conversation, chopping, laughter and warm kitchen camaraderie that culminate in a simple, sit-down supper of soup, salad, bread and wine for all participants. Each event produces approximately 150-250 servings of fresh soup that sustains your local shelter with nourishing and nurturing soup each month. The Doorway assists teens and young adults from the ages of 16-24 who have made the choice to transition from street culture into mainstream society. We offer delicious soup as a simple gift to nurture and nourish, warm and help fill the empty spaces in their lives, both physically and emotionally. It is our hope that the availability of a nurturing, fulfilling bowl of soup made by caring adults from their city will assist these deserving young people on the path toward believing in themselves and imagining new possibilities for their future.